Tazo® offers teas with a twist for deliciously unique flavors. Hibiscus flowers, natural tropical flavors, citric acid, licorice root, orange peel, cinnamon, rose hips, lemongrass and fruit juice extract (color). With its exuberant blend of herbal, floral, and fruit flavors, Tazo Passion Herbal Tea packs a flavor punch that will excite your most adventurous guests. This aromatic blend of herbal teas offers perfect pucker for tart lovers thanks to vibrant hibiscus, bright orange peel, tart rose hips, and zesty lemongrass. The naturally sourced ingredients delight the senses with thrilling flavor in every sip. 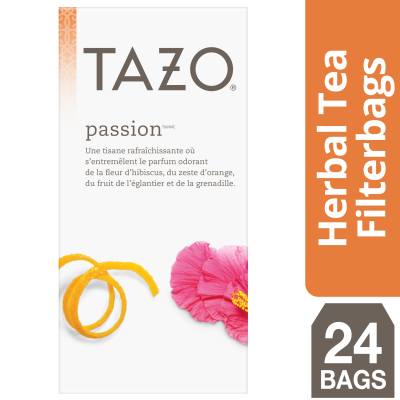 Ideal for restaurants, cafes, hotels, and office environments, this package includes six boxes of 24 individually wrapped bags of Tazo Passion Herbal Tea. Whether you're an office manager looking to ignite the creativity of your workforce, or a café owner in search of a deliciously unique flavor offering, you will love serving this blend that inspires joy and wonder with every sip.